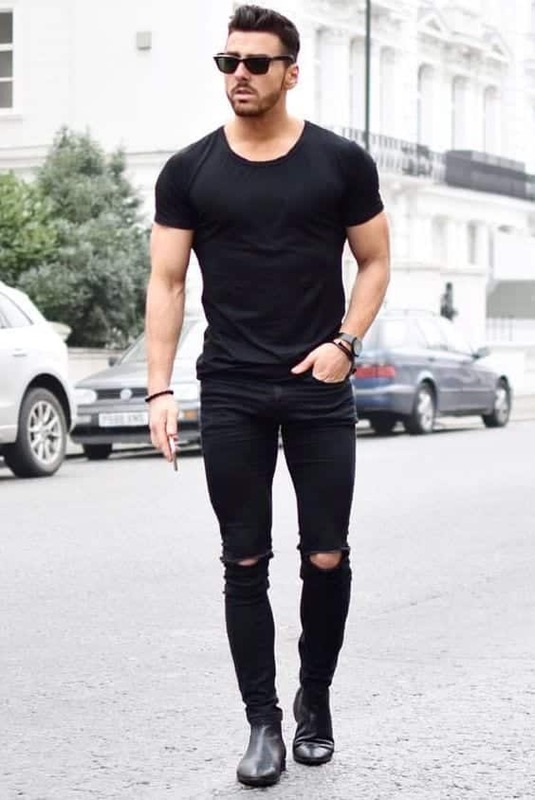 Black jeans outfits for men. What good is a wardrobe if it isn’t too messy, abundant and yet redundant with too many denim and black jeans and t-shirts spoilt with your favorite slogans or decorated with abstract and wayward patterns complimenting your favorite trance band? Let’s face it – our wardrobes are casually oriented, but we all face problems of coordinating them to head-turning hilt. Today, we would like you to go through your assortment of skinny, distressed and ripped black jeans and learn how you could highlight your simple street-wear with just a look of majesty and utter versatility. Pro-Tip: Ripped black jeans and a black strap-on watch can be your go-to look. Wear them with a crew necked t-shirt and you’re good to go to any casual date or the movies with your friends. Regardless of the coffee, black jeans can look good in almost anything. Other than a pair of skin-fitted or distressed black jeans, go for matching tones for the upper and the inner shirt. Compliment a grey checkered shirt with a black ravishing cotton or fleece-lined jacket and welcome style into your category. Whether you pair your biker leather jackets with a flannel shirt tied around your waist or a loose, over-sized under your jacket, your black jeans should be the utter constant and complimentary to your grunge look. Throw in a hat or a baseball cap worn backwards to hit it off. Getting the right flannel shirt to wear atop your black jeans is also an ordeal. You really don’t want to look like a walking circus or be too bright for the sun’s rays. This could be your uber casual look for days when you can’t decide what to wear. Other than plain grey or black tees, check never goes as well. Nobody said that dress shirts are just for the office. Pair your black jeans with a white button down collared dress shirt and complete the look with a skin-fitted black sweater for the win to college. The rule is to wear a sweater with a dress shirt, so make sure you refer to this salient recommendation in the winter. Throw on any t-shirt or a sweatshirt atop your favourite, skinny, ripped black jeans. Stroll to your nearest Starbucks in a beanie or a woolen cap with a pair of earphones whilst you listen to Nirvana or Pink Floyd on a Sunday. Everybody knows how to wear hats, but do you know which hats to wear? Black jeans have been proving their versatility again by complimenting hats. Pair your hat with a worn out navy denim jacket and a pair of ripped black jeans and a plain white long shirt to your date this weekend.] or use any of the following looks to polish off your all-black affair with supreme elegance. As for this year’s update, ASOS has introduced some beautiful cape styles to rock your average black jeans for men. This cape with a paisley border from ASOS gives you another chance to take a look at wrap-ups and coordinate them ardently with your ripped black jeans. If Jared Leto is not enough to convince you that ponchos can help you to hit off our average black-jeans-look, we wonder what will. We have been witnessing abstract prints by the hundred nowadays, and all of them will slay your all-black look. You can also adjust your shawls, scarves or capes in the form of a poncho, or wear an extremely long baggy overall over your black jeans. We suggest our male readers to be creative with this fashion stance and popularize this look on a day to day level. Not just kimonos, but ASOS is rewarding your baby blues with a denim kimono. Wear a kimono over a white shirt or any pastel shirt over a pair of black jeans to help create a grunge look. Get in touch with the 70s and tattoo your denim jackets with embroidered abstract work or other pieces of art. This year, welcome art and patterns into your closet. Show how you can accentuate your black jeans with the most vivid of all styles with this fresh denim jacket. Ditch your vans and wear your boots to the mall under a pair of black skin-fitted jeans. You called and we answered with Ryan Reynold’s quirkiness and abrupt puns. IF you’re done drooling over his awesome comebacks, you should know that Reynolds has a lot to offer to the world of style as well. As shown here, you can see Ryan Reynolds standing ardently in a pair of black jeans, a pair of boots and a breath-taking overcoat to top the look. 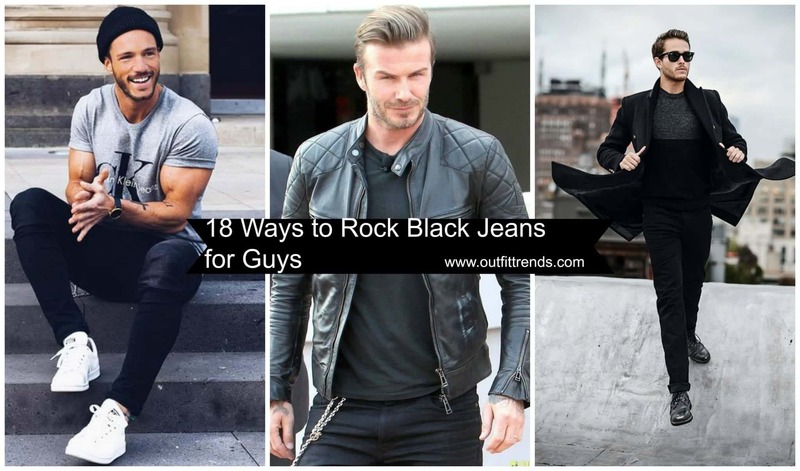 It’s official – an all-black outfit topped off with a black leather jacket has caught the world of male fashion by storm. Can you see how beautifully this man has paired his leather jacket with a simple pair of vans? Leather jackets are quite in these days, but if you are considering wearing them during summer, sweat will not be a surprise. It isn’t every day that you’d be lucky to see a plaided bumper button-down shirt on a pair of black jeans with black suede boots, a pair of Raybans and a beret on the street. Hand it over to celebrities like Beckham or Ryan Reynolds to add sophistication to a simple pair of black jeans by pairing them with formal jackets and long overcoats, respectively. Do you have any more looks that can top off our checklist?